One of the world's leading home phone providers has just stepped into the mobile game, just like it's 1990, and has announced three new phones you can actually leave the house with. 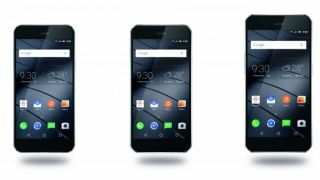 German manufacturer Gigaset has launched a new series of smartphones in the form of the Gigaset ME, Gigaset ME Pure and Gigaset ME Pro. The Gigaset ME and Gigaset ME Pure both feature 5-inch Full HD displays while the Gigaset ME Pro features a Full HD 5.5-inch display. Both the ME and ME Pro are running Qualcomm's octa-core Snapdragon 810 processor with 3GB of RAM while the ME Pure is running a Snapdragon 615 with 2GB of RAM. All three phones run the latest Android 5.1 Lollipop software with new Type C USB ports included as well so you won't be struggling to fit your cable in again. The ME and ME Pro both have 32GB of internal storage while the ME Pure is restricted to 16GB but luckily it supports up to 128GB of microSD storage to make up for it. All the phones feature an impressive 8MP front facing camera whille the ME has a 16MP rear shooter, the ME Pure a 13MP sensor and the ME Pro comes with a huge 20MP sensor. All the phones feature 120-degree wide-angle lens as well as the ability to film 2K video. The new phones are set for a European and China launch in "autumn 2015" so an official release date is not too clear just yet. If you're tempted by these impressive sounding handsets from a surprising source, the ME Pure will set you back £249, the ME is £349 while the ME Pro costs £399.